A pretty (and bra-friendly!) 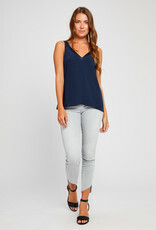 v-neck tank top with satin-like trim. Fabric: 58% Rayon, 42% Viscose. Designed in Vancouver.